You may recall me mentioning here, that I bought an antique camel wagon wheel that had been made into a mirror. It's not every day you run across one, so of course, I snapped it up. It's enormous. Over 5 feet across. To get it home, it was strapped to the roof rack of my Mini Cooper while the edges hung off over the sides. Imagine that zipping down the freeway in traffic! Click below to continue reading. When I got it home, The Man didn't even seem surprised (He's used to my shenanigans) and actually loved the mirror. We had a lot of laughs about whether we should clean off some of the "patina" (if you know what I mean). But as you can see below, we decided to keep it as found. Since it was so large and heavy, he made custom iron brackets to hang it up in the entry. I think it's the perfect size and shape for this room. The scale and texture add drama and create a strong focal point to an otherwise simple space. 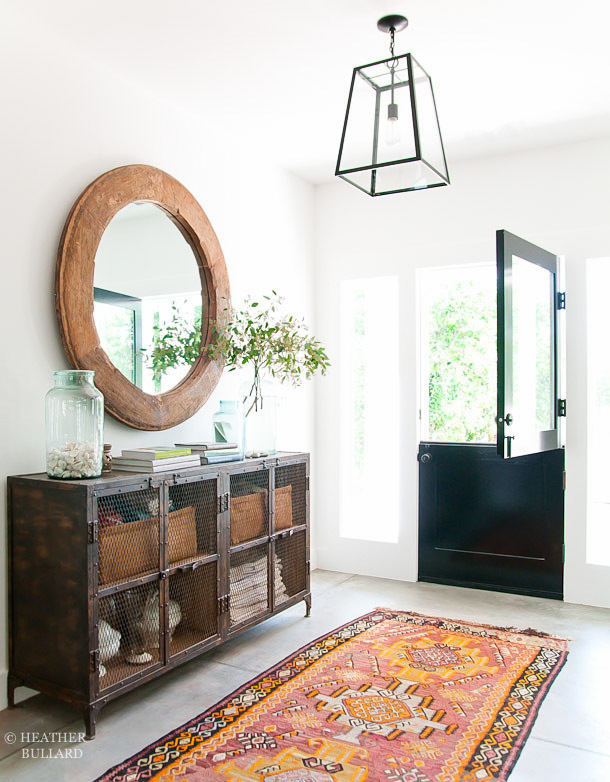 I bought the antique kilim rug at Sourced Collective in Laguna Beach. Right now, it's the most colorful item in our home. Not sure if it will stay here in the entry, or be moved to the studio. Still trying to get used to the color. In other news, I'm completely infatuated with eucalyptus. The last three trips to the flower shop involved bringing bundles of them home instead of flowers. I love their neutral hint of color and silvery leaves. My favorites are Silver Dollar and Seeded. Although eucalyptus is not new to me, it's like I've discovered it for the first time and I'm relishing my crush. I may be bouncing around a bit on the Grove House posts. Since we are essentially living in it now, it's hard to go back and write everything chronologically. Having no internet access for months put me a bit behind. I hope you don't mind the zig zagging as I try to catch up on the details. Between posts you can find me on Instagram (heatherbullard) sharing the little things in life.